Many cities in America law enforcement tends to group together certain ethnic-groups mostly being young black and Hispanic men, tying them back to gang-related violence and homicide crimes. Like in Sacramento, gang-related violence accounts for more than a quarter of the city’s 30-40 annual homicides according to police reports. Due to the nature of the crime and fear of witness involvement police struggle to solve these killings, creating a never-ending cycle. Therefore, the city officials came together to draw up a plan: intervening directly with the young men who are in the violence including known shooting suspects-before they too wind up dead or behind bars again. The idea and strategies came from a program called Advance Peace, they believe in offering financial incentives to the young men if they stay out of trouble. Police around the country consider gang violence a major factor in homicides nationwide which make these difficult to solve. According to a study done in 2007, more than half of the 52,000 homicides in 55 large cities have led to no arrest, the investigation is still ongoing. It also states that 38 cities have lower homicide arrest rates now than a decade ago. Not being able to solve these crimes leaves killers on the streets and fuels the cycle of violence. The efforts of police in Sacramento have proven to be more successful in solving murder than many of their city counterparts. Arresting nearly 65% of the homicides since 2007, including 53% of killings related to gang violence according to the Washington Post. The normal protocol for arresting one shooter seemed to just pave the path for the next one. 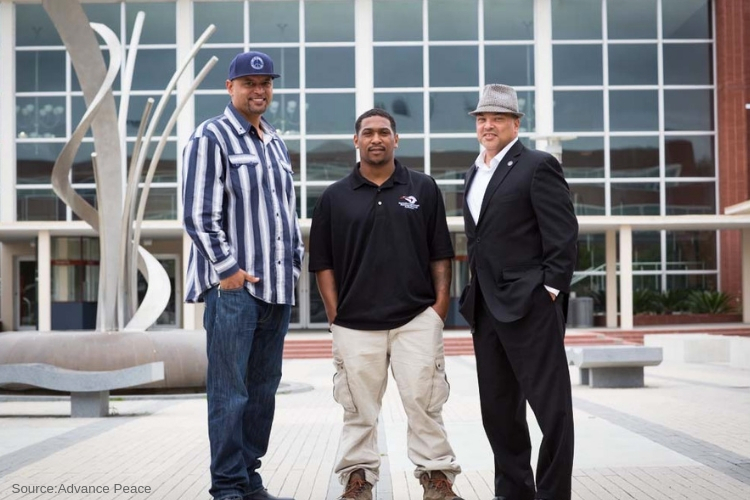 So, Sacramento partnered up with Advance Peace, a program that mentors young black and Hispanic gang members to help develop a “life map” of short or long-term goals while introducing them to social services. These mentors help young men find a purpose in life and stay on track, which most find difficult because of their surroundings. They aid with securing drivers licenses and jobs, guiding them to stable housing or drug treatment if needed, listen to problems and arguments that could otherwise end up deadly. The cash incentives come in after about 6 months of sufficient progress towards the individuals long and short-term goals. The participant becomes eligible for an allowance of up to $1,000 a month. The program has enrolled 39 young men in Sacramento so far. Many people consider it an innovative program that provides resources and attention to young men like never before. Giving them access to services they would have never gotten before. However, the financial incentive has fueled controversy across the state. Many of the critics have asked why these young men deserve the investments when they have already committed these violent crimes. The founder of the treatment program nearby Richmond, California DeVone Boggan said the cost of not intervening is far worse. Back in 2007 Boogan was appointed to run the city’s new program Office of Neighborhood Safety. During that time the 100,000-person city on the east side of San Fran Bay had one of highest murder rates in the country. The program model he came up with was based on the ideology of programs such as Operation Ceasefire, which started in Boston in 1990s aimed to reduce violence and to treat violence as a public health crisis and to use social services. However, the programs often relied on heavily faith communities and police officials to lead. Boggan decided to limit police involvement and have former offenders run the program. In 2016 the city of Sacramento invited Boggan to be a keynote speaker in the annual Violence Reduction Summit. Among the audience was Muttaqi, who was head of Sacramento’s gang prevention and intervention task force since 2011. As he listened to Boggan explain the Advance Peace success in Richmond he thought to himself, why not try the program in Sacramento? With the rise in violence and gang-related shootings, the city voted to give it a try. August 2017, the city council had voted to contract with the Advanced Peace program coming days after a shooting in Meadowview Park that left one dead and four injured. The deal would be that the city would provide about $1.5 million over the next three years from its gang task force funding covering half of the program’s funding. Just days later controversy exploded out of control with an article on Fox News website inaccurately declaring the city had approved, “$1.5 million in cash stipends to gang members. . . from the city’s general fund.” Other critics followed. Eventually, the media calmed down while city officials found space for it downtown while many officers questioned the program and how it would be implemented the city’s police chief backed the program. Police and the community helped gather dozens of young men known to have ties to gangs in the surrounding areas who could attend the programs. The first person the city hired is known as Julius Thibodeaux, former drug dealer and gang member who had served 23 years in prison for attempted murder as its program manager. Julius first herd of Advance Peace shortly after getting out of prison in 2016. His nephew Shepherd had completed the program in Richmond and suggested Thibodeaux work as a mentor for the Richmond program, later applied to run the Sacramento pilot. Since he had hired a half-dozen members and by July had encouraged 39 young men to join the program. The program has been up and running for only a few months but hopes it will include 50 young men and 25 children younger than 18. Many mentors have built relationships with young men including mentor Marcus McGhee who is well known in Sacramento’s rougher neighborhoods. He thanks his past for being able to mentor these men and relate to them as no one else has before. He met John Huston,24 who is an aspiring rapper and grew up in the same neighborhoods as McGee. John dreamed of escaping the life of Sacramento by enlisting into the army, but his dreams were shattered when he was caught with an unregistered gun that he bought for protection after he got shot several times. Huston said, “Some people, a lot of people, don’t want to live this life,” Huston said. “But they’re stuck in it.” Before meeting McGhee, John didn’t have a phone, car or even a driver license. Although Huston isn’t enrolled in the Advance Peace program he has worked with McGhee to put together a life map. Including a plan for writing and releasing music, applying for a driver license and having to show up for job interviews. Huston said his life is already turning around.